After our grad school years in Minnesota--during which we spent four buggy summers and three very long, cold, dark winters studying Blue Jays--the Hilton family moved back to York SC in 1982 and settled on 11 acres we now call Hilton Pond Center for Piedmont Natural History. While in Minnesota we banded and color marked nearly 2,000 jays and numerous other species and looked to continue our avian research at Hilton Pond. As soon as we closed on the property--and several months before moving in--we erected bird feeders near the old farmhouse that was to become our home. We stocked them with sunflower seeds, millet, and corn in the hope of being able to hit the ground running with bird banding efforts. 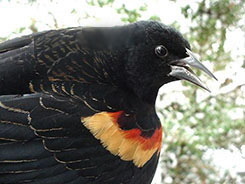 That spring we received our Master Bander permit from the federal Bird Banding Laboratory, moved to York, and banded our first bird--a male Red-winged Blackbird (left)--on 30 June. Soon thereafter we also hung and began maintaining feeders for Ruby-throated Hummingbirds, but because hummer banding requires special authorization from the BBL, we merely watched these little jewels as they flitted and fed outside our windows. We continued to observe hummers throughout 1982 and 1983, becoming very curious about how many we might have living at or migrating through Hilton Pond Center. 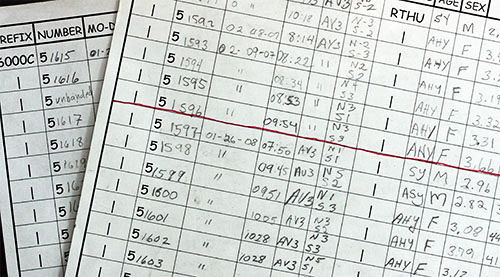 We eventually applied for and received hummingbird banding authorization from the BBL and on 25 July 1984 captured our first ruby-throat--a life-changing event that ended up taking us places doing things we never imagined. This week, in our 25th year of hummingbird banding, what may be our finest "hummingbird jubilation" to date transpired--although tinged with sadness. We've actually had several jubilations over hummingbirds--primarily from those we banded at Hilton Pond that showed up elsewhere (see map above). The first came in October 1991 when fellow hummer bander Bob Sargent drove all the way from south Alabama to the outskirts of Atlanta to recapture a young male ruby-throat we had banded ten days earlier at Hilton Pond. This was FIRST Ruby-throated Hummingbird EVER recaptured and released by anyone more than ten miles from its banding site. This auspicious individual apparently was heading along a southwesterly migration route that would take it to traditional wintering grounds in Mexico or Central America. Another jubilation occurred when Fred Bassett recaptured one of our fall migrant Ruby-throated Hummingbirds at Robertsdale, Alabama in October 2000--17 days after we banded it at Hilton Pond. One more of our ruby-throats was found dead by Parrish Pugh at Thomaston, Alabama in late September 2006--two weeks after banding--and a fourth bird (color marked with green dye on its breast) was seen in fall migration at Cameron in western Louisiana. 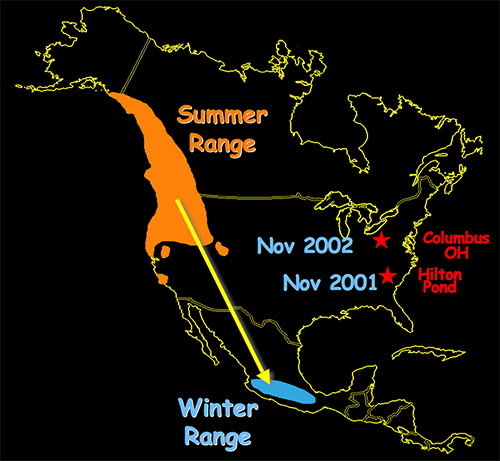 Lastly, there was that out-of-range Rufous Hummingbird, banded here at Hilton Pond in November 2001 (above) and recaptured the following winter by Allen Chartier 350 miles to the north in Columbus, Ohio! Indeed, this wandering rufous and all the ruby-throats just mentioned were rare happenings and genuine "hummingbird jubilations," but they STILL don't hold a candle to what transpired this week. By way of background information, we remind readers that each winter we lead hummer banding excursions to Costa Rica, which is just about as far south as any Ruby-throated Hummingbirds migrate during the non-breeding season. (A few do get into western Panama.) To date we have taken more than 50 U.S. or Canadian citizen scientists--teachers, backyard birders, and hummingbird enthusiasts--to Guanacaste Province in the northwestern corner of the country. There we rendezvoused with Costa Rica educators for eight days of observing Ruby-throated Hummingbirds on their wintering grounds, specifically within Aloe Vera plantations. During five expeditions we've banded 267 ruby-throats in the only systematic study of this species south of the Rio Grande River. As a result we've made some interesting discoveries in the tropics, such as when three hummers showed up one year later in the same Aloe Vera field in which we banded them. These birds--all of which had bands whose inscriptions began with "C5" (right)--were sources of considerable "jubilation" because they must have departed Costa Rica shortly after banding, flew to North America for the breeding season, and then returned to the very same locale to provide the FIRST evidence of hummingbird site fidelity on the OTHER end of their migratory route. Again, ALL these hummers--four Hilton Pond Ruby-throated Hummingbirds encountered in Georgia and Alabama and Louisiana, a wintering Hilton Pond Rufous Hummingbird that showed up 12 months later in Ohio, and three Costa Rica ruby-throats we recaptured a year after banding in the same aloe field--were legitimate causes for "jubilation," but all were overshadowed by this week's happening that once more involves fellow hummer bander Bob Sargent. Let us explain. Most active hummingbird banders in North America subscribe to a private chat group called "HumBand," through which we exchange netting, trapping, and banding techniques and discuss population dynamics and other matters that pertain to hummingbirds. 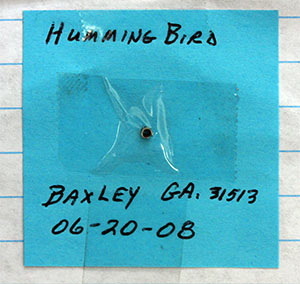 In recent years--as the number of hummingbird banders has increased--it has become common a few times each year for a group member to post a note soliciting information about a banded hummingbird that he or she has just recaptured. 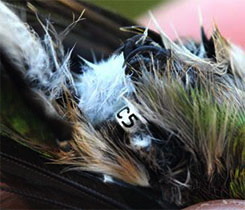 The proper protocol when anyone finds a banded bird is to report it to the Bird Banding Laboratory through its toll-free number at (800) 327-BAND, or via an on-line form at the BBL Web site. Hummer experts file such reports when they recapture a bird, but often paperwork for a recently banded hummer will not yet have been submitted by the original bander--hence the desire for further info. If this is one of your bands would you contact me privately. It is my understanding it has been reported already to the BBL. As we downloaded our Hilton Pond e-mails first thing that morning, we scanned messages to see if there was anything of pressing importance and almost had cardiac arrest when we saw Bob's subject line with "C51599." We KNEW from the first few characters of the number it was likely one of our hummingbirds, and we knew all the birds with that sequence were banded on our winter study site in Costa Rica. With pounding heart and shaking hands we pulled out our banding file for Guanacaste Province and looked for C51599, finding that number among data sheets from our 2008 expeditions. Sure enough, this particular Ruby-throated Hummingbird was banded in Aloe Vera field #3 at 9:51 a.m. on 26 January 2008. "Jubilation" to be sure, and of the highest order! After seeing Bob's posting and checking our data we immediately e-mailed him a note that C51599 was one of our banded ruby-throats from Costa Rica. While we waited for his response we pored over our data sheet (above)--knowing that one way or another C51599 was destined to be a bird of great significance. It was just the third ruby-throat we banded during our first week in Costa Rica this year, a week when a stalwart group we called "Crazy '08s Alpha" journeyed with us to Guanacaste to erect mist nets and help capture and observe hummingbirds. We caught C51599 in the first net we put up that first morning on-site back in January, concluding from its white throat and wing configuration it was an adult female that hatched out at least in the summer of 2007, or possibly in an earlier year. C51599 was molting her plumage--as Ruby-throats do on their wintering grounds--with numerous new body feathers coming in. 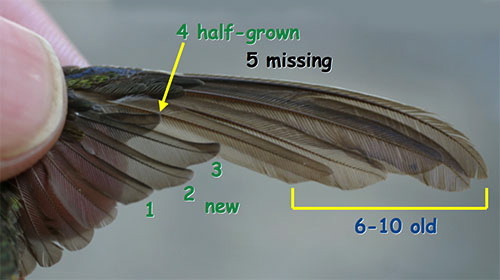 Of her ten primary wing feathers (see representative photo above of a different bird), the first six were new, #7 was half in quill, and #8-10 were old ones with which she had flown to Costa Rica; all ten of her tail feathers also were old. She weighed 3.05g, had a wing chord of 44.27mm, a tail measure of 26.0mm, and a culmen (upper mandible ridge) 19.0mm in length. Within an hour of responding to Bob Sargent's inquiry about C51599, Bob wrote back to us with basic details about this soon-to-be-famous ruby-throat. It turns out Bob himself hadn't encountered the hummer but had heard from a guy who had: Stacy Carter, detail shop manager with Cothern-Varnadore Chevrolet-Mazda dealership in Baxley, Georgia. We decided to call Stacy directly for first-hand info about C51599. By phone, Stacy Carter excitedly told us how he found the hummingbird on the morning of 20 June 2008. The bird was lying motionless on the ground at the entrance to one of the dealership's service bays, tightly entangled in spiderwebs. Stacy picked up the bird and saw it was still alive, so he worked to remove the cobwebs--being careful not to injure his captive. Eventually he was able to remove all the silk and took the hummer indoors, where an office worker placed it on a yellow file folder and snapped a few photos (above). Although alert, the bird was exhausted by the ordeal and could not fly--one of Stacy's colleagues thought the bird may actually have been on the ground since the previous day--and unfortunately it succumbed soon thereafter. In the process of unravelling the spider webs, Stacy noticed the bird was banded and figured his find was potentially important. He called local natural resources personnel and other agencies and eventually was directed to Bob Sargent, to whom he read out the band number. Bob posted the number to HumBand, notified the Bird Banding Lab, and later got word from us at Hilton Pond about the origin of the band. Stacy removed the band from the dead hummer and mailed it to Bob who forwarded it to Hilton Pond Center (below left) as absolute, positive, unequivocal evidence C51599--banded in Costa Rica--had shown up in Baxley, Georgia almost five months later. 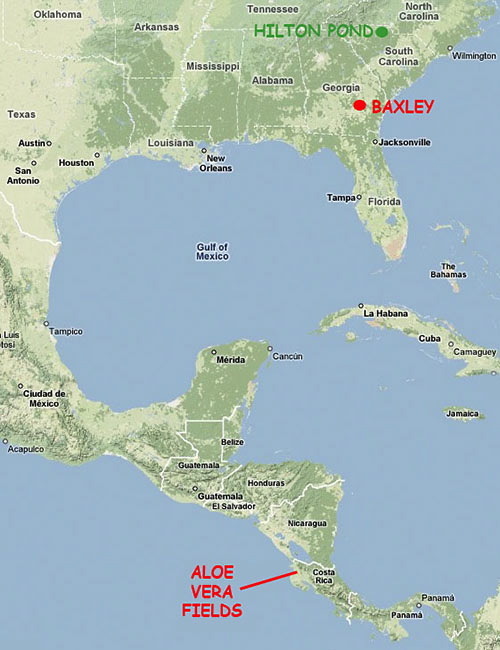 Baxley (see map above) is about 1,500 straight-line miles from Guanacaste Province, but the hummer undoubtedly took a less direct but unknown route moving north. Sadly, this bird died at the end of her long journey, but the recovery was still cause for great jubilation. And why? Well, mostly because C51599 is the VERY FIRST Ruby-throated Hummingbird--and possibly the first of ANY hummingbird species--to be banded on its wintering grounds in the tropics and then be encountered later within its North American breeding range. We don't know whether this little bird hatched and fledged in Georgia, but thanks to Stacy and Bob we DO know it spent at least part of the winter a long way to the south and returned as far north as the Peach State. Considering the tininess of hummingbirds, the distances they migrate, and how few of them are banded, the odds of someone finding a banded hummer are pretty small, so we're especially jubilant Stacy Carter took the initiative to report this very special bird--thus helping provide the first documented evidence Ruby-throated Hummingbirds from Costa Rica really DO return to the U.S. or Canada the following spring. The "ultimate jubilation," of course, would be to catch one of our Costa Rica hummingbirds at Hilton Pond, or vice versa, so we'll keep on with our banding work at both locations. 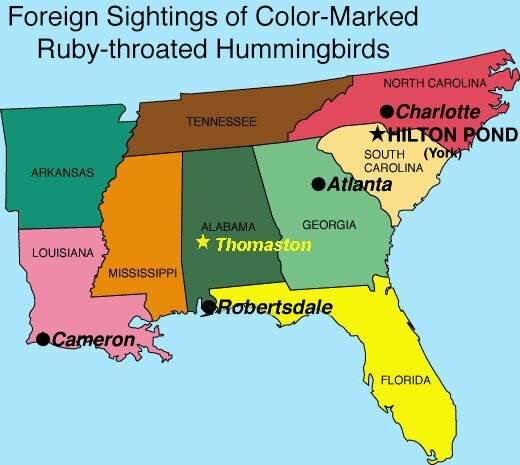 NOTE: There's so much more we have to learn about Ruby-throated Hummingbirds. Care to follow the hummers to Guanacaste next winter and learn along with us? 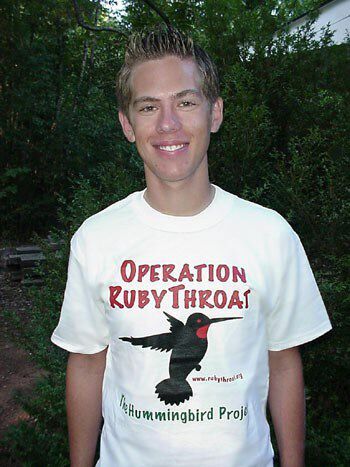 If so, please see Operation RubyThroat/GLOBE Hummingbird Expeditions. --As of 30 Jun, we've now banded more than 51,000 birds over 27 years here at Hilton Pond Center. For a revised chart that shows individual tallies for the 124 species we've banded since June 1982, please see Research Table 1: Banded Species. --Ruby-throated Hummingbirds continue to be unusually scarce around Hilton Pond this year, with only seven banded through June (none at all in May). 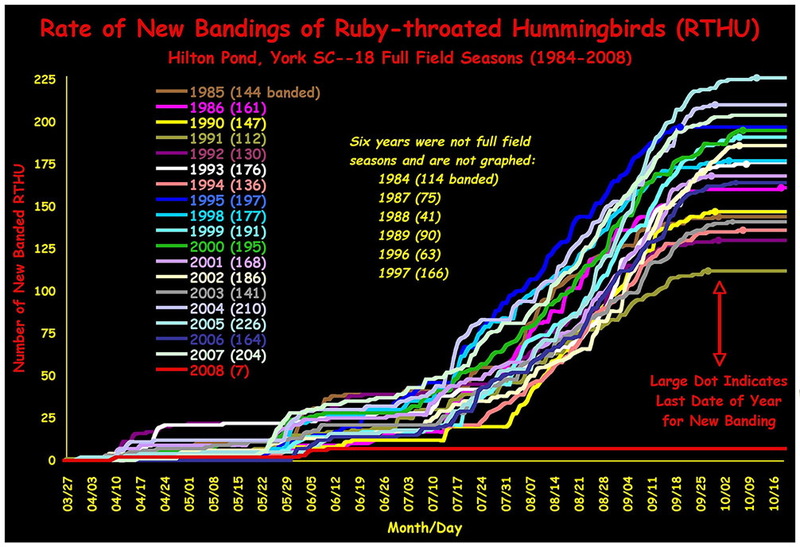 Our average since 1984 by that date is 26 RTHU banded, and last year by 30 June we had captured 39! 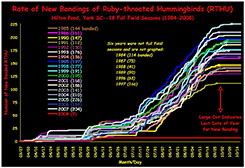 Returns of RTHU from previous years are also nearly absent in 2008, with only eight banded through June; by this time last year we had recaptured 43. For a closer look at how RTHU bandings have accumulated annually by calendar date, click on the thumbnailed chart below. Despite our current despair, we suspect things will pick up quickly in early July and continue to improve through mid-September, but the way things are going it's hard to see how we'll be able to band 200 RTHU this year.